It took the timely intervention of Bi-Courtney Aviation Services Limited (BASL), operators of the Murtala Muhammed Airport Two (MMA2), Ikeja, to avert a major disaster when a fuel-laden tanker caught fire on the ever-busy Lagos Airport road, on Wednesday afternoon. 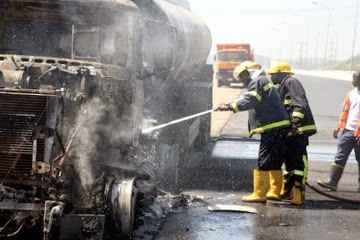 The tanker, which belonged to a petroleum company, Heizol, with registration number, Lagos MUS 165 XK, was reportedly conveying diesel from Apapa to an unascertained location in Ogba, when it suddenly burst into flames in front of the Federal Airports Authority of Nigeria (FAAN) headquarters and close to MMA2’s multi-storey car park. FAAN’s fire fighters immediately mobilised to the scene but could not completely put out the fire. It was at this point that the management of BASL intervened and ordered its water hydrants to be opened up for the use of the fire fighters. Commenting on the development, the Chief Operations Officer of BASL, Ms. Adebisi Awoniyi, said the company’s action has further demonstrated the generally-acclaimed functionality of MMA2 and its level of preparedness for any form of emergency. Efforts to get FAAN’s response on the incident was unsuccessful. Industry operators have severally criticised the movement of fuel from Apapa to the airport, saying it is dangerous because of the highly inflammable product, recommending that government should build hydrants at the ramps.